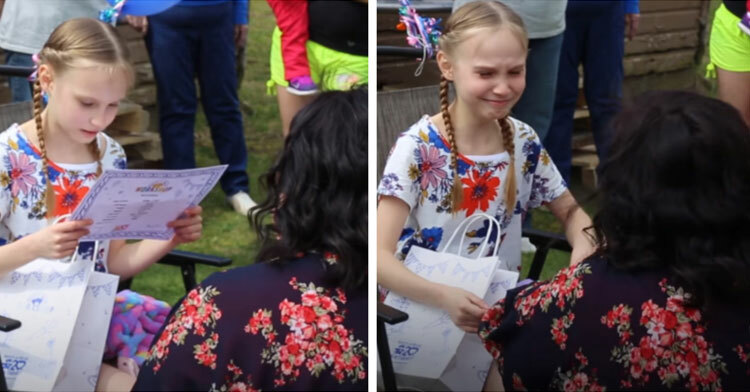 Birthday Girl Reads Note On Stepmom’s Gift & Breaks Down At Life-Changing News. 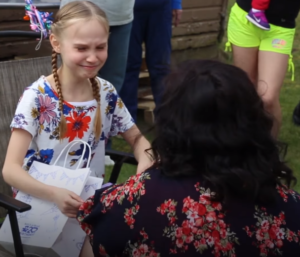 If you asked Hailey Fries of Kearns, Utah, for the most unforgettable day of her life, she’d tell you it was when she celebrated her birthday in 2017. 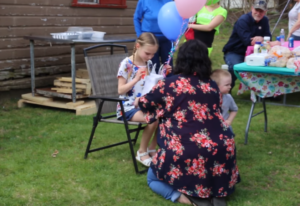 But it wasn’t the balloons, cake, or even the presents that made this birthday party so special for the little girl. It was the life-changing news she got from her beloved stepmom, Brigitte, who’s been fighting for years to become Hailey’s legal parent. Another family member caught the precious moment on camera, which has since made millions tear up. 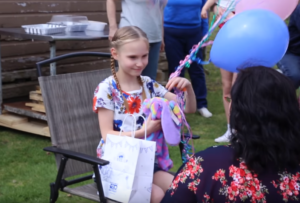 We see the birthday girl sitting in a chair while Brigitte kneels in front of her and presents her with a special gift bag. 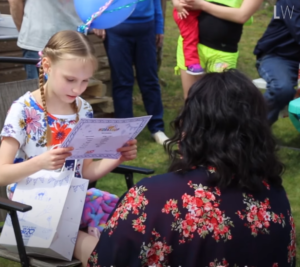 Hailey pulls out a stuffed animal from Build-A-Bear Workshop and a necklace inscribed with the phrase, “my daughter holds my heart.” But the best gift is still yet to come. Build-A-Bear Workshop makes cute birth certificates for their plush toys, so Hailey got one as well… though hers was much more special. In the video, we see Brigitte handing it to Hailey and asking her to read the other side. “It is in the best interest of Hailey that the child should be adopted by her stepmother, Brigitte Fries,” Hailey reads aloud. “Brigitte’s petition for adoption should be and is granted.” That’s when she breaks down, realizing Brigitte has officially become her adoptive mom. 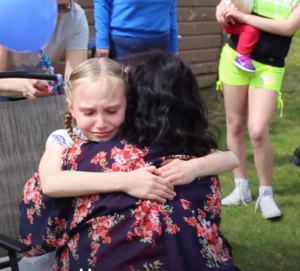 The little girl wraps her arms around her mom, sobbing. “I love you so much,” she says through tears. 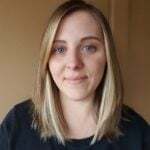 “We had been pursuing the court system for 5 years to gain permanent custody after a long journey,” Bridgitte wrote when she uploaded the video. 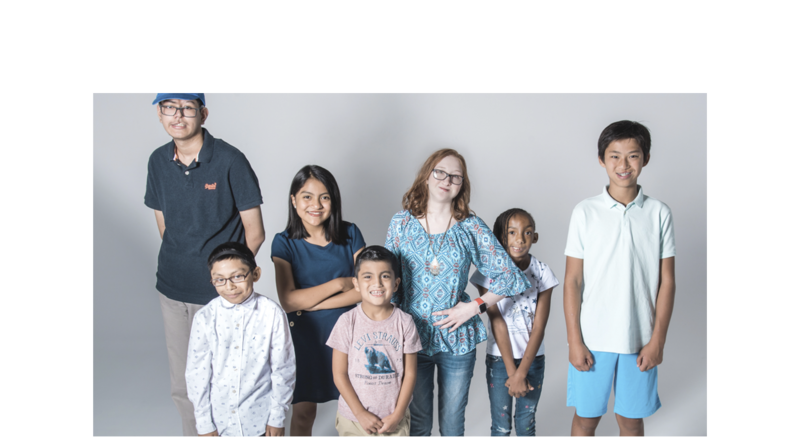 “I filed for adoption and one year later it was approved.” Hailey had been reading the judge’s statement, which had been pasted to the back of the certificate. It’s clear Brigitte loves her daughter so much and only wants the best for her. That’s why she more than deserves the title of Hailey’s mom. We’re so happy for these two and wish them nothing but the best as they enjoy their new life together. Grab some tissues and watch the heartwarming moment shared between mother and daughter in the clip below. Share with other awesome moms to show your appreciation.